I hadn't intended to go out hiking today, but as I sat in front of my computer at 8am typing up an overdue TR, I realized I'd rather be outside than doing the mundane inside. I checked the weather report and found it called for a 60% chance of rain - even that wasn't going to keep me inside. I tossed the rain jacket in the daypack with the other usual items and headed out not long after 9am, late enough to get most of the morning commute traffic out of the way. Today's objectives were four summits at the periphery of the park, two of them actually outside. I had looked at these on my previous trip here a few weeks ago but did not have enough time to include them in that day's overbooked agenda. I spent about an hour on the drive, paid my entrance fee at the South Gate and parked at Curry Point. Clouds would keep the sky overcast for most of the day, a few drops would fall during my outing, but overall a very fine day for hiking. An interesting feature found shortly after I started down the road is a marker on the side that shows the Mt. Diablo Meridian. I had to stop and think for a moment before realizing what it was. It lines up along the N-S line passing through the summit of Mt. Diablo where the point was established in 1851 for which most of the surveying of Central and Northern CA along with all of NV originated. It was from this point that the Meridian (N-S) Line and Base Line (E-W) were established whereby triangulation could then be used to accurately survey the surrounding lands. This is a small feature shown on the park map, found along the Knobcone Point Road. It looks most interesting when approaching from the north but upon closer inspection it isn't balanced all that precipitously. At first glance it appears a difficult rock to ascend, but there is a use trail leading to the backside where a class 4 route can be found up the 15ft of prominence on that side. Not far east of Balancing Rock the park boundary is encountered, marked by a green gate, unsigned. Property on the other side is owned by the Save Mount Diablo foundation. Their purpose is to buy up surrounding lands to save them from development. 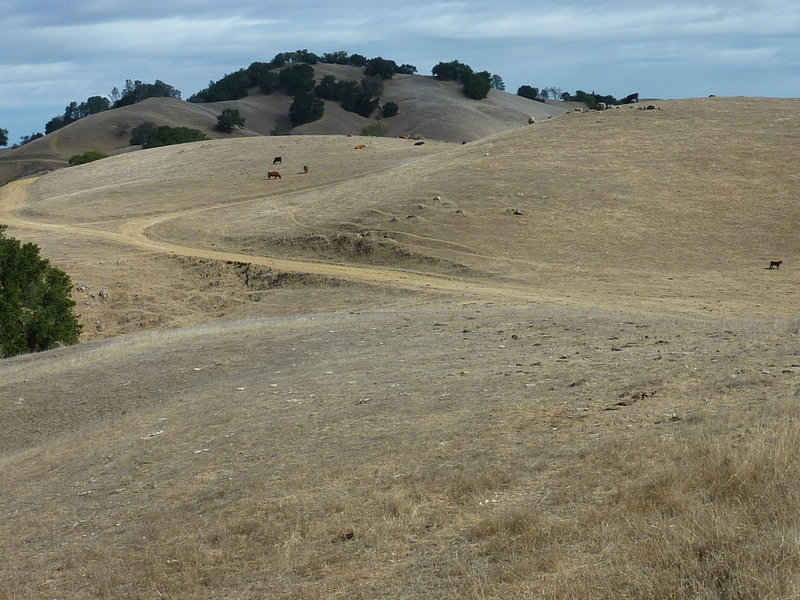 This 1,080 acre parcel is known as the Curry Canyon Ranch, acquired in 2012. It has not yet been opened to the public except on select docented hikes and is still primarily used for grazing. The road on the other side of the fence showed numerous bike tracks and a few boot prints to which my own were added. Windy Point is located 2mi along the road from the gate, the first half a shaded, view-deprived hike heading southeast and then turning northeast. As it passes to the north of Cave Point the road comes out upon open, grassy hills. A dozen cows with small calves were grazing and resting here as I passed by. They were some of the tamest cattle I have seen - one that was standing on the road let me pass within a few feet and others simply watched me go by, not even bothering to get up from there resting position. Mt. Diablo is viewed impressively all along this section of road to Windy Point, with the Curry Canyon drainage in the foreground. A barbed-wire gate is encountered just before the summit, the last 200ft requiring some easy cross-country and another climb over the barbed-wire (made easier by a convenient rock along the fenceline if you look for it) back onto Save Mount Diablo property. The highpoint is found under a couple of old oak trees and doesn't offer any views, but those immediately off the summit are quite nice. One can see far into the Central Valley (barring haze), south to Mt. Rose and west across the East Bay Hills. And of course, Mt. Diablo looming large to the north. This was an easy sidetrip on the way back from Windy Point as the road passes a short distance below the top across the northeast side. If approaching the top from the east as I did, the highpoint appears at first to be a small rock outcrop that is heavily guarded by poison oak. I spent some minutes trying to cautiously find a way through to no avail, only to discover the true highpoint about 20yds further north at another rock outcrop partially hidden by oaks. Some poison oak present here too, but careful dodging can avoid it. I wondered where the name had come from since I didn't see any obvious caves at the summit. Upon descending north on my way back to the road I came across a whole of sandstone rock features with small and medium-sized caves and holes where the softer rock has been eroded out of the harder surrounding rock over the ages. This was the most interesting of the summits I visited today and the hardest to reach. It is located inside the park not far from Balancing Rock. I had looked for use trails earlier when I was near the latter feature, but found nothing but heavy brush, far too thick to plow my way through, knowing there could be poison oak lurking in there. Instead I started down the Powerline Access Trail to the east. Branching off this, I had seen a thinner trail in the satellite view that looked like it might offer a way to Knob Point. This turned out to be a climber's trail that makes its way to some large rock features SE of Knob Pt. I followed a thinner branch off this to the base of a rock face where I found two bolted routes going up the rock - someone had put in a lot of work to place about a dozen bolts on this sad little rock face - Yosemite this is not. I worked east around this face following a faint trail that led to some other horizontal rock features that I scrambled along and across as a way to make it towards Knob Point with minimal bushwhacking. It appears that folks have carved paths through the brush in several places over the years and though not regularly maintained, they afforded easier travel than the raw brush would have entailed. The final summit rock required climbing up through some mature manzanita to scale the highpoint. It would be nice to say the views were sublime and worth the effort, but that would be untrue. The real fun was simply in getting there. Off to the northeast about 150yds were two pock-mocked sandstone features sticking up above the tangle of brush and trees. They looked to be of nearly equal height and far more difficult to scale (maybe 5th class), possibly the features for which Knob Point was named. The name itself is a bit of a mystery. The nearby road is called Knobcone Point Road, named for the Knobcone Pines that grow here. It may be that the point was originally Knobcone Point with "cone" dropped on the USGS map. In any event, I'd had enough of the brush by this time and decided to head back the way I'd come. Wow you have 2 months left in the year. You are going to smash your all time peaks in a year record this year ...........nice !